It was tucked into the pages like a bookmark, postmarked Fort Lauderdale, dated December 3, 1979, and addressed to an apartment in Evanston, Ill. Th­ere was nothing else in the book—a collection of John Cheever stories I’d just bought at the used bookstore a couple blocks from my Chicago apartment. Here I am in Florida, taking in the warm climate and sun. Spent today in Coconut Grove, the “artist area” in Miami. Next week I’m going to Disney World. I’m having a good time just relaxing before I start my new job in Mpls. I’m going to hate to go back but I do look forward to a “new life.” Take care, enjoy the snow! No other clues about Craig or Marla, the life she was leaving or the one she was about to begin. Just the postcard—one side of a conversation I wasn’t part of. It suggested a story that it refused to tell. I imagined Marla on the beach, sitting in the shade of one of those palms, paining over the postcard; and Craig, alone in Evanston, the snow falling outside his apartment window, parsing her every word, just as I was. I had found things like this before, like a copy of Call of the Wild bearing an inscription from a father to a son with instructions to learn from the book the meaning of the word “honor.” But what made this message stick in my brain was the way I felt Marla seemed to be holding something back, not saying everything she had to say. I had been on both ends of such correspondence. I felt like a pryer peering into the private lives of these strangers. But I also felt an odd connection to them. I was in my late 20s, and felt constantly on the doorstep of some new life of my own. How, I wondered, had hers turned out? I wanted to know who they were. I wanted to know their story. And I wanted to know if there was anything that bound this book’s previous owner to me besides a mutual affection for the short stories of John Cheever. Finding Craig was easy. A search of his name and 1979 address led to his faculty page at the university where he still teaches media studies. I sent him an email telling him who I was and what I’d found, and asked if he was the same Craig. He was, and after a couple weeks of exchanging emails, he agreed to meet. Craig was 72 years old. He had a thick white beard and thin white hair and clothes that seemed baggy even on his big frame. A self-described “Uncle of the ’60s,” he said that most of his life had unfolded as an accident. We met at a coffee shop in Evanston, where he still lives. I’d read and reread his postcard, projecting him into something larger-than-life in my mind. But Craig has a sort of clumsy kindness about him that can make one feel as though he is not a stranger, but an old friend. In our email exchanges, he had been brief and reserved—curious, but understandably cautious. But now, on this sunny afternoon in late winter, he was open and warm. The postcard, he told me, seemed to have had a life beyond even what he knew, and drew him back into a past that he said he hadn’t thought about in a while. Craig and I were similar in a lot of ways. Both of us preferred asking questions to answering them—for me, at least, a product of a tendency toward self-consciousness. We both believed that art has a responsibility to challenge the status quo. And both of us were teaching college. What he loved most about teaching, he said, was showing students how to learn about themselves and the world around them through media—something Craig had spent his whole life doing. The son of a theater manager who moved the family around a lot, Craig was a perpetual outsider, a feeling compounded by the fact that he was gay, a secret he felt compelled to hide while coming of age during the 1950s and ’60s. By the early 1970s, they were living together in Madison, where Alice worked as an interviewer in the state jobs program and Craig started on his master’s at the University of Wisconsin. There, he worked in the instructional media department at the school of nursing and met Marla, a nurse, and her husband, Bill, who was studying to become one. The couples lived in adjacent buildings. Craig saw the two at work daily, and the couples would go out or invite each other over for dinner every couple weeks, and remained close until Craig graduated and moved with Alice to Evanston. One day, they got a call from Marla: Bill had come out as gay, and he and Marla were divorcing. 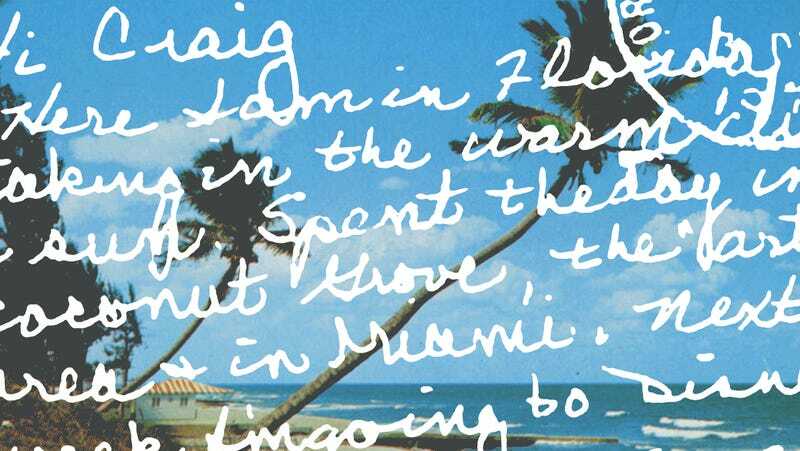 In letters to Craig, she described her depression (“I have been using most of my energy to regain my emotional stability,” she wrote in one), her resuming smoking, and her travels across the US and Europe before settling in Minneapolis; on a trip to Florida, she sent Craig the postcard I’d find. A year passed and Alice took an offer to return to work in Madison. She and Craig remained married, talking on the phone each day and visiting one another on weekends. But Craig felt vulnerable. He, too, was gay, and felt that with Alice gone, the truth he’d spent years hiding would have to come out. With the help of a friend from graduate school, he told his friends, family, and eventually, Alice. After 17 years of marriage, they divorced. Alice remained in Madison, and Craig in their Evanston apartment until a few years ago, when he moved into a smaller place, just off the Howard Red Line stop. He packed up his belongings, sold off the 1,400 records he’d spent his life collecting, and donated most of his books to the Brown Elephant in Andersonville. One of them, John Cheever’s 1973 collection The World of Apples, somehow found its way down Clark Street to Bookworks in Lakeview, where on a December afternoon, 35 years to the month it was mailed, I would find the postcard inside the book. We talked about Cheever. We were both casual fans at best, which made finding the postcard seem, in some ways, even more coincidental. The owner of the bookstore, which goes out of business this month, told me that Cheever is one of her store’s top sellers. Most of their stock comes to them via book scouts, who purchase books cheaply from places like thrift stores and garage sales and resell them for a few dollars apiece. When she buys a book for the store, she flips through it to gauge its condition. Sometimes, she’ll find something in there—notes, drawings, newspaper clippings, old CTA passes. If it’s something “quirky or related to the book” in some way, she’ll leave it in. If not, she tacks it to a wall behind the counter of the store. “They have a life,” she told me. At the time I reached out to Craig, he was beginning to create what he called a “timeline” of his life: a chronological collection of notes and artifacts he hoped, when complete, would give him a better sense of who he was and where he came from. That I had stumbled upon a piece of this puzzle seemed, to both of us, something like fate. For months I sat with Craig as he went through his past. We talked about the postcard, but most of the time we talked about him: memories of his childhood, of the time he spent closeted and the time after, and of the difficulty he had hanging onto some of those recollections. Some of his remembering is done with the artifacts. Some of it is done with help from Alice, who still lives in Madison and never remarried. Craig told me that they are closer now than they were during their marriage. Both said they’d lost touch with Bill and Marla in the mid-1980s. I’ve tried to get in touch with you the last times I’ve been in Madison. And now there is no longer a phone number listed for you! So I wrote to this address in the hope that if you’ve moved, the letter will be forwarded. Sorry it has been so long since I contacted you. Much has happened that I would like to share with you. Do hope you get this and that I hear from you soon. The note was returned to sender. Bill died in 2002, at age 52, from cardiac arrhythmia. Craig never told him that he too was gay, or that Bill’s coming-out had been inspirational. Neither Craig nor Alice knew what had become of Marla after she moved to Minneapolis. They didn’t know if she had remarried, or if she had gone back to using her maiden name, or what that name was. Using information from the letters she had sent to Craig in the years after her divorce, I was able to locate a woman named Marla who fit her description living in northern Wisconsin. I felt like I had gotten to know her through letters, so I sent her one myself. She never responded. I spent time with Craig over more than a year. In one sense, he seemed content. He spent several days a week teaching, meeting with friends for lunch every so often and writing long emails to them when they couldn’t meet. But he also seemed lonely. He loved being around people, and he was living alone. There were things, he felt, that hadn’t gone the way that he had hoped they would—and at 72 years old, he was no longer sure there was time to change them. One afternoon, over coffee at his apartment, I asked Craig if it was working. Eric Lutz is a writer of fiction, journalism, and essays. He lives in Chicago.